Dear friends, I have been dreaming of making this Halloween costume for two years now. I had the idea last year but time got away from me and I just didn’t get it done. You honestly have no idea how many weird craft project ideas I have that don’t get done. Ha. But this year, as autumn began to roll near, I knew what I had to do. 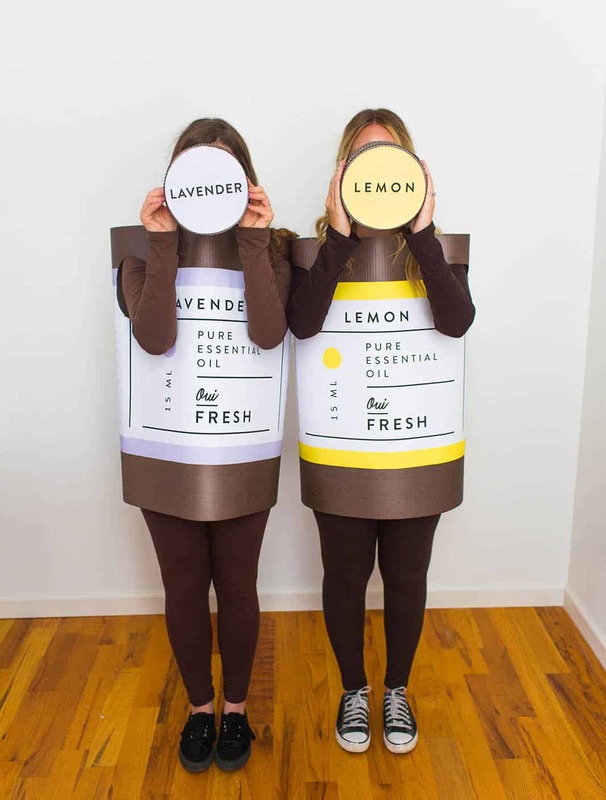 I had to make time to make these essential oil costumes—it was destiny. 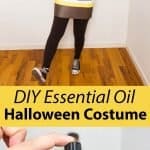 Why would anyone want to be an essential oil bottle for Halloween? Other than the obvious (like it’s a very flattering shape for any body type), mostly I just thought it was really funny. Is it truly funny? I don’t know, but I think so! 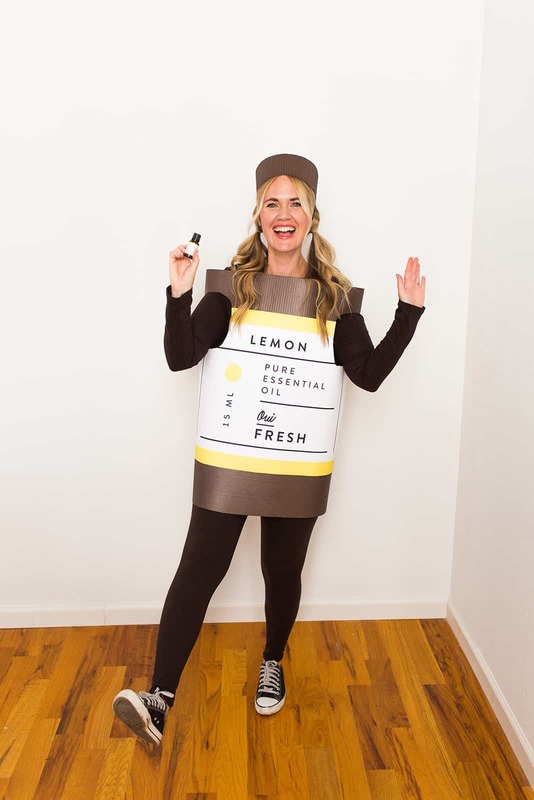 In addition to just making me laugh, I also sort of loved the idea of dressing up like a Oui Fresh product for Halloween. 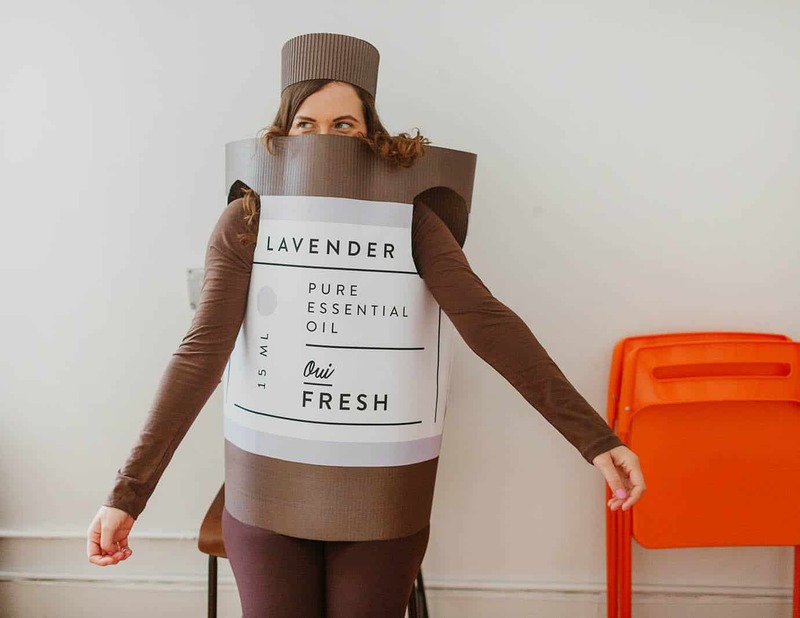 I love our essential oils and I am truly proud of them … so much so that I apparently want TO BE THEM. I recruited Jacki to also be a bottle with me. She’s a good friend. Note: I added the bottle cap stickers to our costumes too. 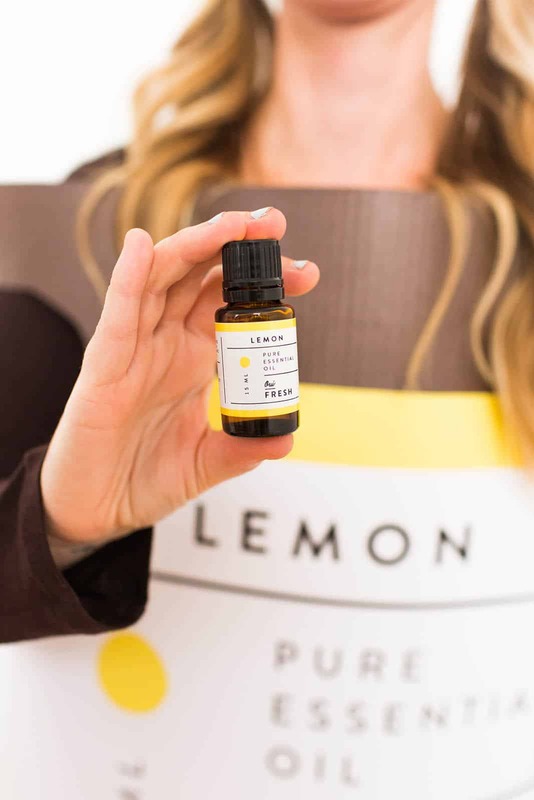 We have the real stickers available for our oils (free with any $50 purchase). And this was a detail I just couldn’t leave out! Now, I’m no Studio DIY, but I must say I am pretty proud how these costumes turned out. And truthfully, they were extremely easy to make. 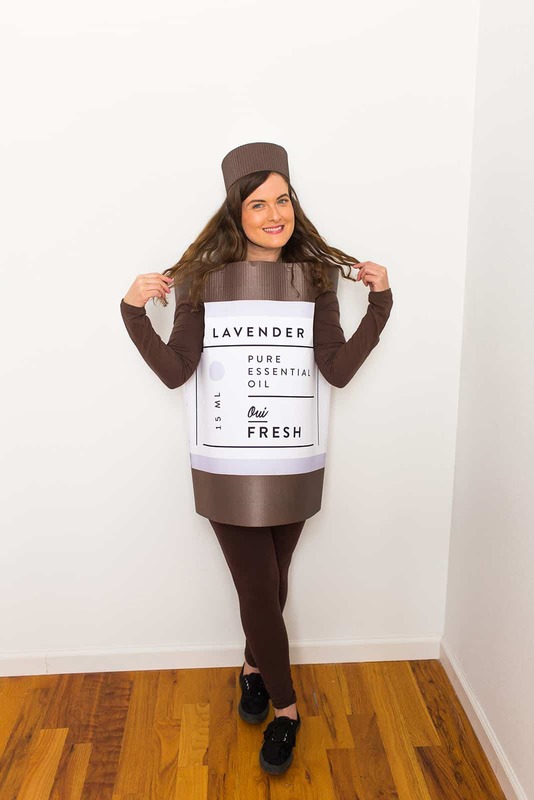 I’m going to share how even though I doubt there is anyone else out there who would want to be an essential oil bottle for Halloween. But, maybe you could use this to make a different type of bottle—I could totally see some Shopkins costumes being made from this basic shape. 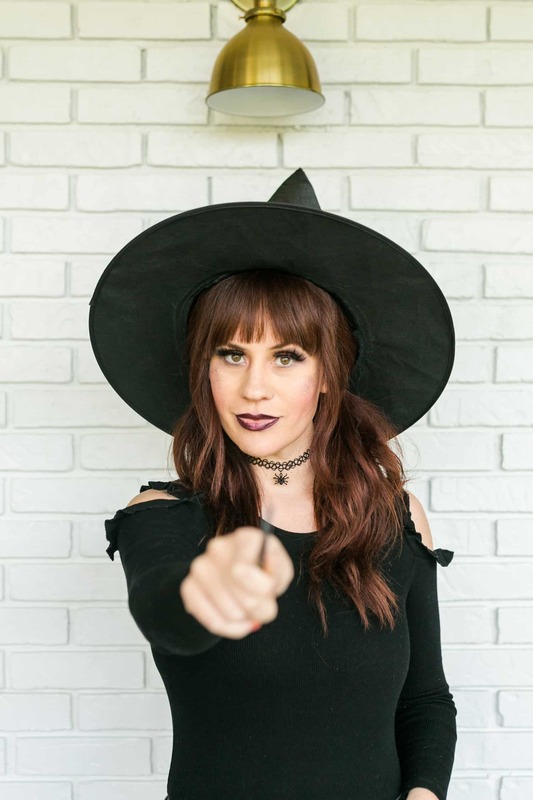 *If you live in area where it will be warm for Halloween, then a short sleeve shirt would be better, but I’ll be in Nashville this year so I have a feeling it will be chilly. Here you can see what the two pieces look like before you paint them and add the label. I think you can pretty much tell from the photos how to construct these (they are just as simple as they look). Step One: I measured my hips and shoulders to make sure I made the bottle piece large enough to fit around me. Then just cut to your size and cut out arm holes (start small and you can always trim them larger once you try it on and see how it feels). 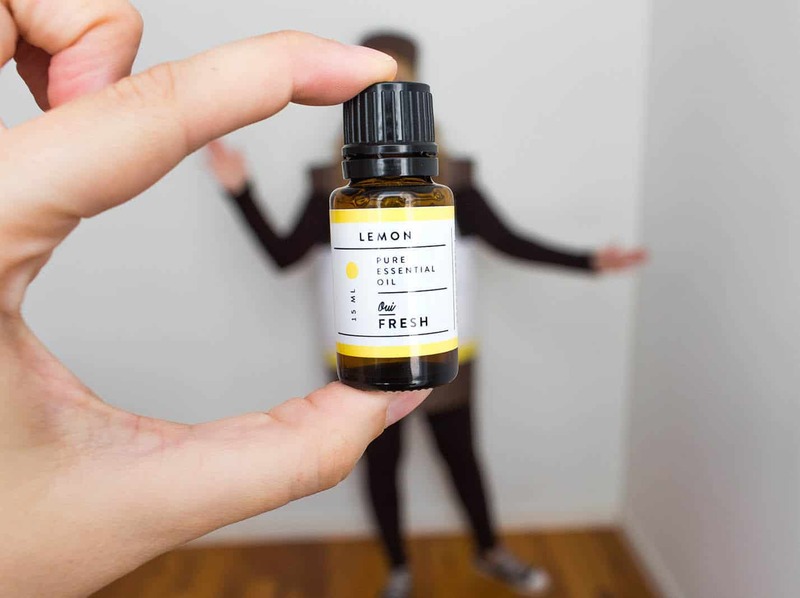 Use strong tape to adhere the bottle together, then cover with masking tape so the spray paint will stick to it (it won’t stick to shiny/glossy tape well). 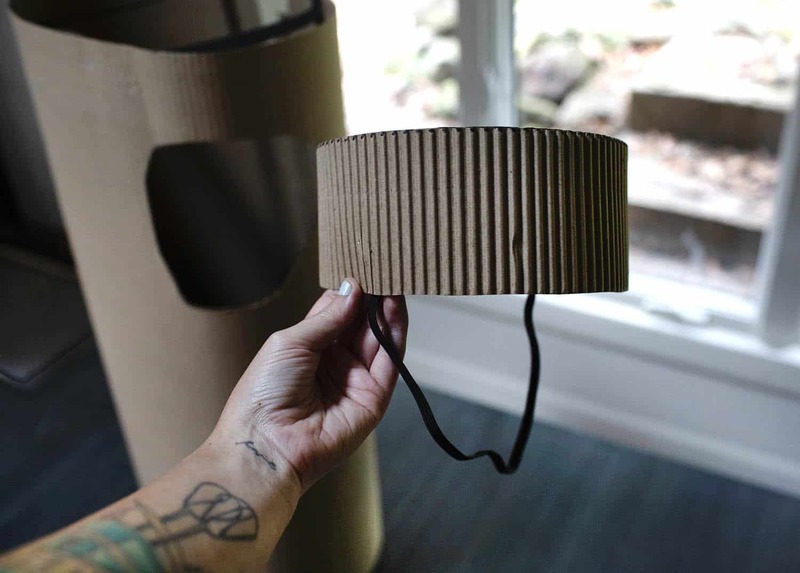 Step Two: For the bottle cap hat, I used the other side of the corrugated cardboard to mimic the ridges on our essential oil caps. 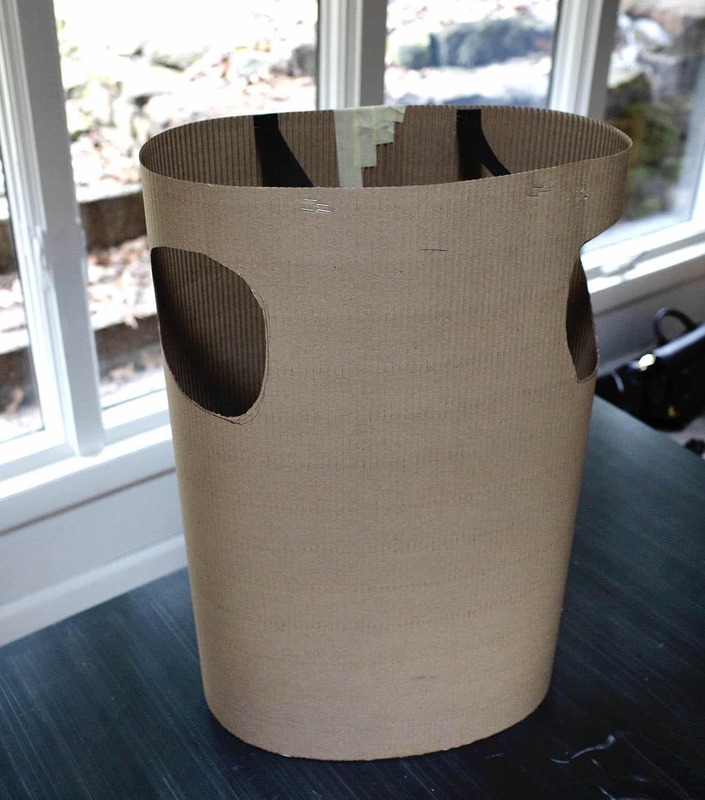 Tape this together with a top piece of cardboard, then use the masking tape again for any area that shows on the outside (that you plan to paint). Step Three: Spray paint the bottle and cap and allow to fully dry before stapling on the elastic shoulder straps and chin strap. Step Four: Trim the label to fit the bottle then use glue dots to adhere it. 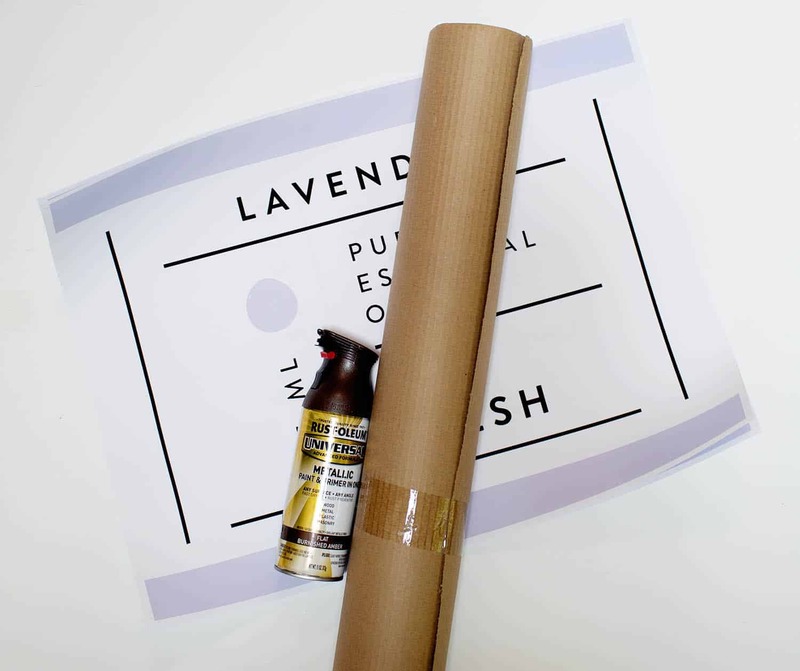 You could also easily paint a label onto your bottle instead of using a printed poster like I did. 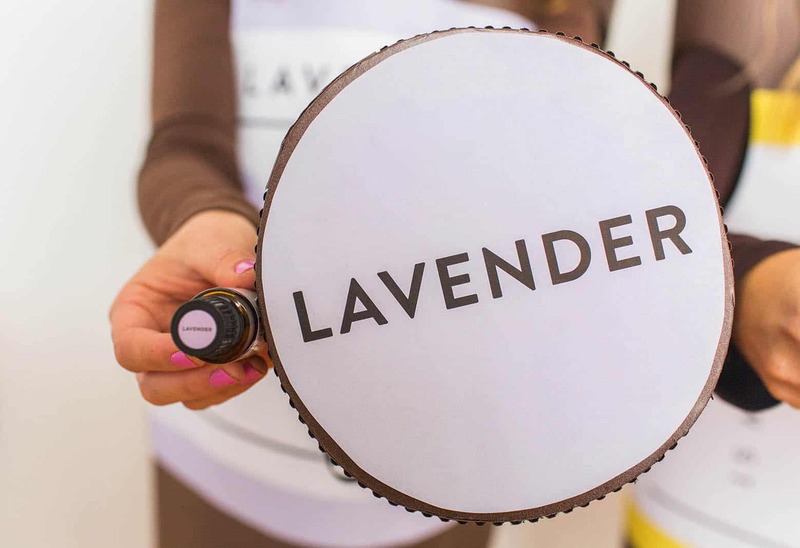 Slip the costume over your brown shirt and leggings and you’re ready to go trick-or-treating! How hard are these to take on and off? I’m glad you asked. So if the easiest slip on dress you own is a 1, and the most structured dress you ever tried on and got stuck in while in the dressing room is a 10, then I’d say these are around a 5 or 6. They are not the easiest thing to put on ever, but they do slip over your head and the elastic keeps the bottle sitting on your shoulders. Credits // Author: Emma Chapman. Photography: Katie Day and Emma Chapman. Photos edited with A Color Story Desktop. Ha ha ha ha 🤣🤣🤣 silly random costumes are the best to me so love it! 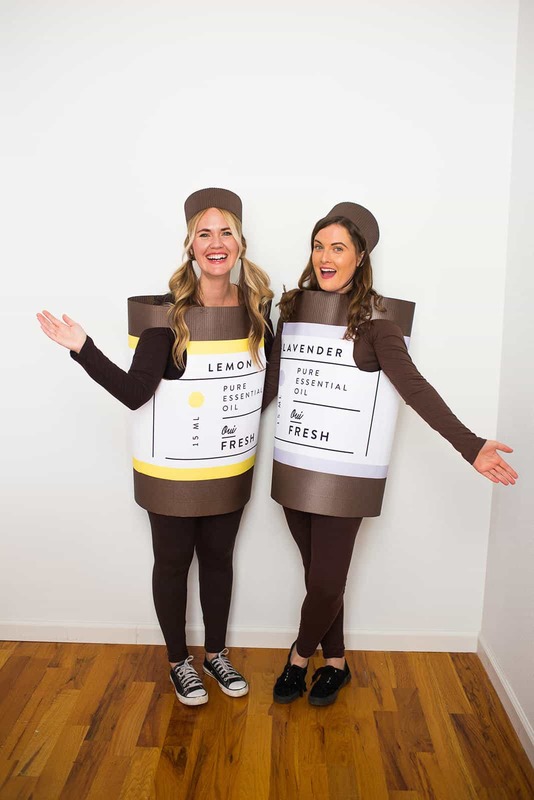 This is such a cute costume idea! I’m obsessed! So cute and so funny! I love it and the candid pictures. This is bound to win an award for most unique costume at a halloween party! This is the absolute cutest idea… I am in complete awe of this adorable costume!!! So topical & creative. Man oh man, Emma. You’re such a fantastic writer. I love this, so hilarious! I’m definitely stealing the idea if I dress up! These turned out so good!! 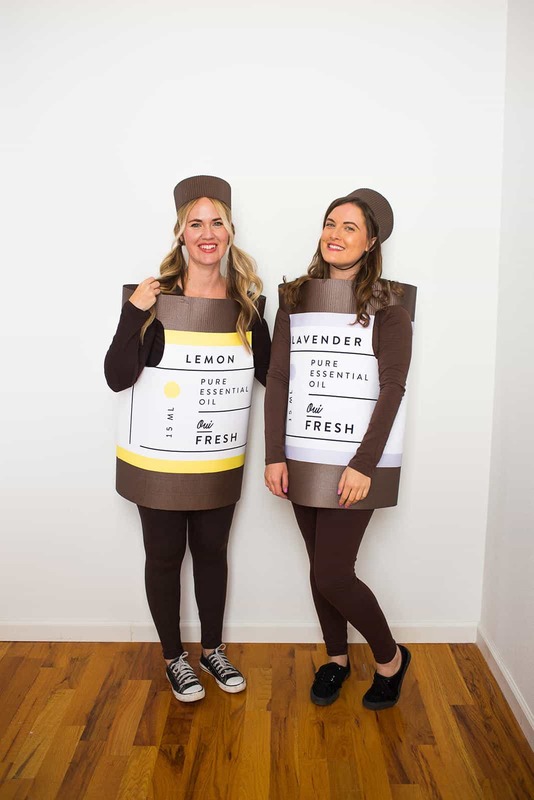 Such a unique (and super fun) costume idea! What a super funny idea, and how original! This is what we call I’m Oiled. Hahahaha. 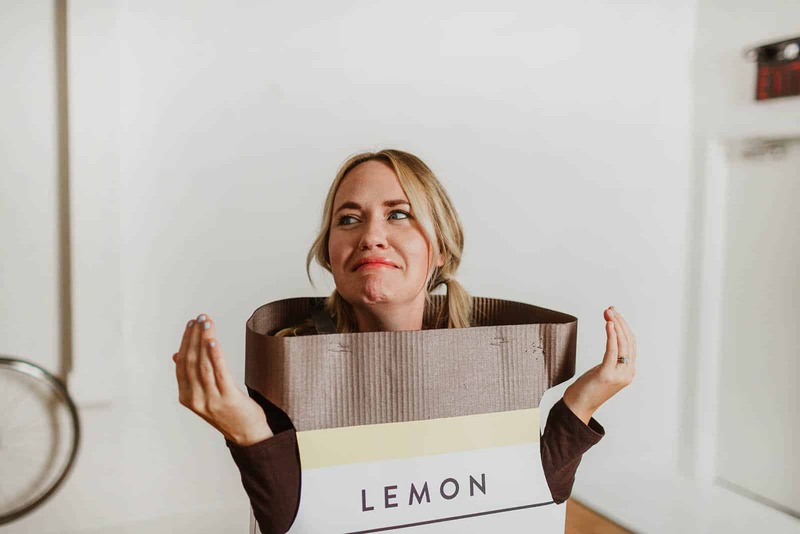 This costume is so funny and totally ESSENTIAL! Plus, I think this kind of attire is totally unique and original. Thanks for the DIY tip!